Tata 'Bambo' Kouyaté is one of Mali's top divas and has been for over 45 years. She got her nickname from her first 'hit' in 1962 at the age of 12. In the song "Bambo" she criticised the custom of arranged marriages. And this in a time when traditions were (even more) solidly rooted in Malian society. And to make things even worse the first public performance of the song was during a gala at a meeting of heads of state in Bamako, organised by the first president of independent Mali, Modibo Keita. The reaction of the president was, however, very positive. He gave Tata a large sum of money and his wife gave a set of expensive clothes. Furthermore he ordered that she should become a singer with the Ensemble Instrumental National (like Wande Kouyaté). Tata Bambo has never shunned confronting what she thought was wrong. With the next Malian president Moussa Traoré this got her into serious trouble. She had sung in praise of the president and expected that he as a patron of the arts (and more particular of Tata Bambo as a djeli) would remunerate her for her flattery. But no reaction came, and Tata confronted the president by publicly demanding that he should do 'the right thing'. The president cautioned her, but Tata Bambo insisted and -again publicly- repeated her demand. On that Moussa Traoré ordered that Tata Bambo should remain restricted to her compound for one year. 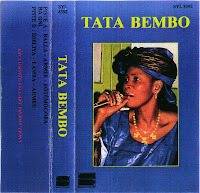 And to aid you in visualizing, here is a video from the 1980s featuring Tata Bambo accompanied by her ensemble, with husband Modibo Kouyaté on guitar.